"What If There Was a Way for You to Unlock Your Full Magickal Powers? What If You Could Break Free from This Mundane Life and Pierce the Secrets to a Higher Form of Existence? Have you ever felt like something was missing in your life? Like there was a whole world out there, full of mystery and wonders, but you had no idea how to reach it and tap into its power? Witchcraft can be a way for you to bridge that gap. To contact the hidden forces that inhabit this world and learn not only how to work alongside them but how to develop your own inner strength! There’s a small problem, though… Magick can make all your dreams come true but it can also destroy you! It’s a double-edged sword that should always be wielded with the strictest care! 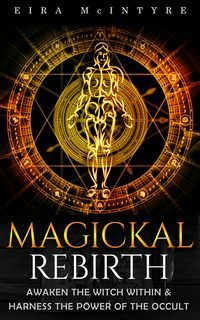 With “Magickal Rebirth”, the first volume in a series that will teach you everything there is to know about casting spells and becoming a powerful witch, you will get a complete rundown on how to do it right. We will start from the very beginning and see both the theory and the practical exercises to build your skills progressively. This will mark the beginning of your initiation, en route to awaken the witch within and unleashing your full magickal power!"